If you are familiar with the Nuts & Bolts series, you'll know the standard of these books, in short excellent. This is no exception, commencing with in-depth text of the development and production of 161/4. The majority of the book is devoted to the Wirbelwind with 3 pages of 1/35th plans and many wartime photos. There are many close-up photos of the hull exterior and interior including the engine. The turret is given even more detail treatment with every nook and cranny shown in close-up. The gun assembly is also shown in great detail. 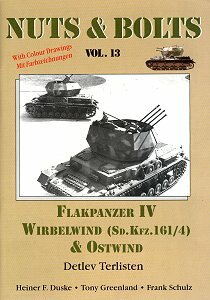 There is also a section on the various models available of the Wirbelwind. The Ostwind is covered only briefly, for as they say in the book "the Ostwind is unfortunately one of the least documented tanks of the German Wehrmacht". There are 1/35th plans and a few photos of a demonstration vehicle and what technical are known are in the text section. In all a brilliant reference book. Highly recommended for those interested in these vehicles and of Wehrmacht vehicles in general. I received my book in the usual short turnaround time from Historex Agents.